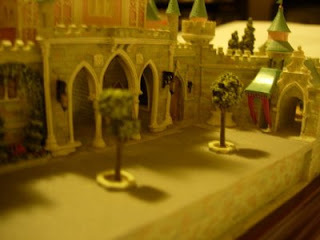 Believe it or not, the photos seen here are not from a picture taken at Disneyland, but are from a miniature model of Disneyland's Sleeping Beauty Castle by artist Robert Olszewski. 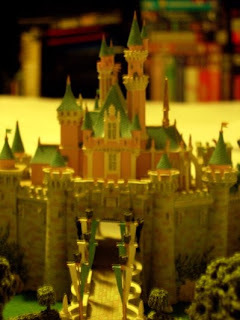 This amazingly detailed model depicts the castle in all directions- front, back side, and inside. If you look closely, you can actually imagine yourself inside it- walking across the drawbridge through the entrance of the castle. 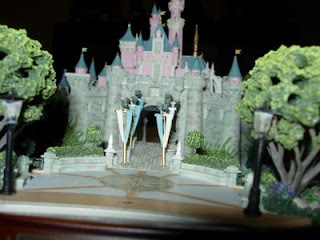 Another thing that is really exciting about this piece is that it lights up- in a dark room, if you turn on the lights on the piece, it acutally lights up the castle and looks the same way Disneyland's Sleeping Beauty Castle looks at night. This piece is part of the First Edition of the Sleeping Beauty Castles made by Olszewski, and it came with a Certificate of Authenticity. This piece, however, is now also available as an Open Edition- only my Certificate really makes mine so special. Mr. Olszewski told me about 4 years ago that he had sent one of these to Michael Jackson at Neverland Ranch, but he hadn't heard from Michael at that point, so he wasn't sure if Michael had opened it yet. He also assured me of this- "when Michael turns the light on, he'll call me".